Our crossing from Russia was efficiently uneventful - the quickest border crossing of outside of the EU so far. The biggest immediate difference was passing from the Caucasian to the Asian in a matter of 500 metres. We looked for an insurance agent, but didn’t see one and figured we’d find one later, or take the risk. It was time to put the hammer down and head for Kostanay and a field for the night. Kostanay is one of those dimly lit towns that aspires to be more than the electric grid will allow. Dusty side streets with a small neon-lit core of banks and shops, the town is wholly dingy and on the surface sleepy. Then, what the hell?? In the space of 90 minutes we had been waylaid by an overly friendly woman looking for a ride, a job, a beer - who knows?, ordered blindly from a menu we couldn’t fathom, gotten followed by some sketchy Latvian in a Mercedes, and driven around and around trying to find our way out of town. The highlight of the whole shenanigan was scooting onto a side road with our lights off to evade the Latvian, all the while laughing like teenagers avoiding their parents. Tom booted up his laptop which held our one detailed map of Kazakhstan and looked for our way out of town. Northern Kazakhstan is one big field, treeless and as flat as a warm three day old Coke. 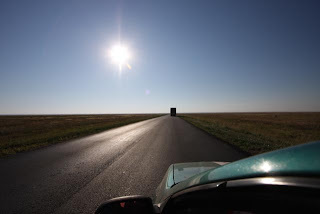 Straight as a lay line the road stretched out invitingly towards Astana, the capital. If we had wondered where all the high tech farming had gone, here it is. Huge mechanized reapers like something out of a James Cameron movie thunder down the roads in search of the next harvest. Vast pig farms and chicken coops consume whole villages. All that’s missing is the ADM logo, or perhaps its there, somewhere in the fine print.